You know that weird, repetitive situation when you tell people you like to cook? It’s borne out of a discussion of what you do for a living (“I’m a medical student”), where you’re going with it (“I’d like to practice OB/Gyn”), and what that involves (“long hours, lots of bodily fluids, and my handy-dandy speculum”), and then you’re desperate to change the subject so you can actually start to make friends. Conversation turns (or, more accurately, catapults) to your hobbies. I’ve been cooking somewhat seriously for several years, and baking for even longer. I cook for myself, for my roommates, for my family, for random birthdays, for anonymous potlucks, for romantic picnics, and sometimes for no good reason whatsoever. I have spices falling onto my head whenever I open my cabinets, more pyrex than I know what to do with, and roughly 12 different flours living in my freezer. I get updates from 50 food blogs on my RSS feed and always have a dinner plan. Truth is, there is so much food out there that I want to make that I’m not sure I’ll get to most of it before I hit menopause. And now I’m supposed to come up with one dish that, among the whacked out culinary creativity I’ve discovered through Google Reader (RIP), I can label as “my signature”? Dude, I’m 25. I am NOT there yet. In an effort to humor the question, though, I’ll usually respond with something I’ve made many times, or something I’ll make for tons of different occasions. 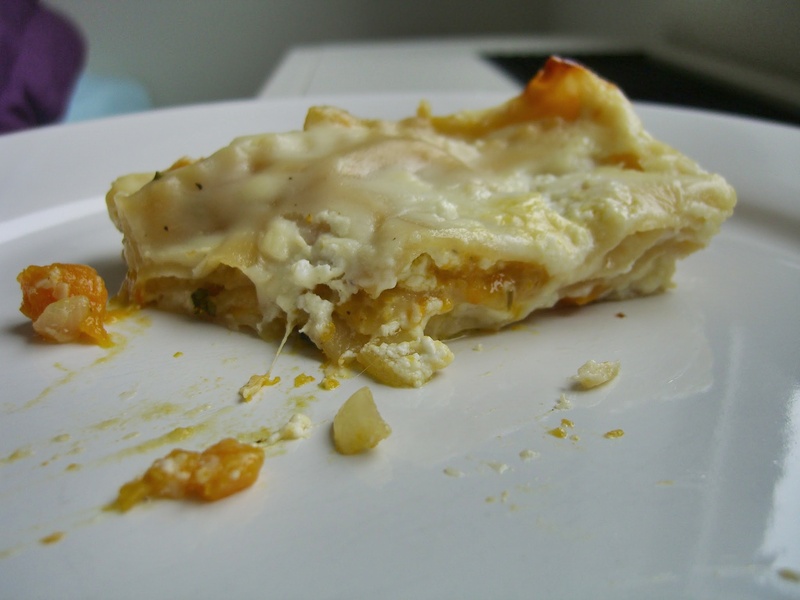 This butternut squash lasagna is one of those. It’s made appearances at all the above scenarios, and does a good job of deluding people into thinking you know what you’re doing. Pre-heat oven to 425°F and grab a 9×13″ baking dish. Toss cheeses together in a bowl and try not to eat all the mozzarella. Heat the olive oil in a large pot over medium heat. Add onions and cook until translucent, about 5 minutes. Throw in garlic and cook another 2 minutes. Add squash, zucchini, salt, pepper, and liquid, and cook (stirring occasionally) until squash is tender, about 15 minutes. Remove from heat, stir in chopped sage, and set aside. In a 3-quart heavy saucepan, melt the butter and cook the garlic over low-medium heat for 1 minute. Add flour and whisk continuously for 2 minutes, then slowly add milk and don’t. stop. whisking. Once milk is all in and there are no chunks of cooked flour, add bay leaf, salt, and pepper, and bring to a boil, whisking all the while. Reduce heat and let simmer, whisking occasionally, until it thickens, about 10 minutes. Discard the bay leaf and remove from heat. Ladle the béchamel into the baking dish so it coats the bottom in a thin layer. Lay down three lasagna sheets with spaces left in between (like the letter E), then ladle another 2/3 cup of béchamel on top. Spread on a third of the squash filling, and then scatter with 2/3 cup of cheese. 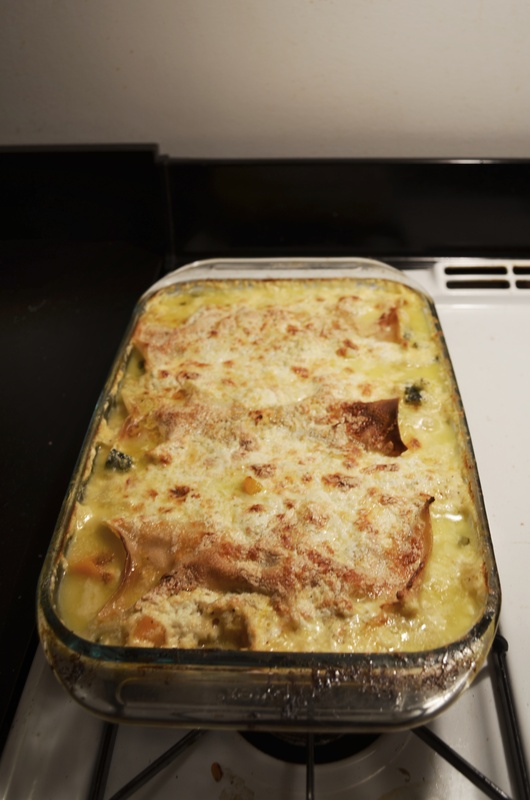 Continue: pasta sheets, béchamel, squash, cheese. Pasta sheets, béchamel, squash, cheese. Lay the final 3 pasta sheets on top, then spread the rest of the sauce and the rest of the cheese on top. Butter one side of a sheet of aluminum foil and tightly cover the baking dish with it (butter side down, dummy). Bake the lasagna in the middle of the oven for 30 minutes, then remove the foil and bake for an additional 15-20 minutes, until the top is golden and wonderful. Remove from oven and let stand 20 minutes before serving. So glad you liked this dish. We love it here too! And definitely looks more impressive than what it takes to put it together.